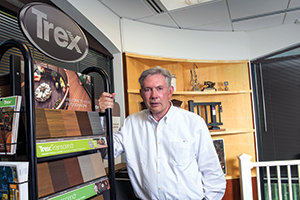 In 2008, Winchester-based Trex Co. Inc. was in bad shape. “There were a lot of sharks circling,” says Ron Kaplan, the company’s CEO who was brought in at that time to save Trex, which was plagued by debt, product recalls and lawsuits. Today, things are looking up for the manufacturer of wood-alternative decking, railing, fencing and trim. The company now is debt-free and profitable. Compared with the same quarter last year, net sales during the first quarter of 2015 were up 20 percent to $121 million, while earnings per share rose 50 percent to 55 cents. Trex also is getting ready to embark on a new journey, as Kaplan is retiring as CEO in August, passing the torch to James Cline, who has been the company’s CFO. But why step down now, when the company is doing well? For Kaplan, the answer is simple. Kaplan will still play a big role at Trex, serving as its chairman. He says he’s interested in serving on some other corporate boards when he retires. Beyond that, he’s not sure what retirement will bring, but he has a home in Stephens City and a condo in Washington, D.C.; belongs to four gun clubs and a country club; and owns a “beautiful” convertible. “If I can’t figure out what to do, I’ve got problems,” he says. Virginia Business interviewed Kaplan at Trex’s headquarters in Winchester, where he discussed the company’s turnaround, its growth and more. Kaplan: Well, the company always had a great brand and great distribution, but its operations, financial affairs, quality control were all in a state of disarray and somewhat chaotic. There were a lot of sharks circling. A lot of litigation, product recalls and so on. Now it’s a finely tuned disciplined organization. It is profitable. It is debt-free. It has an expanding market share. It’s the number one producer in the United States, and we’re exporting around the world. So, we went from being highly leveraged to become debt-free, from being unprofitable to being profitable, from being an undisciplined to a highly disciplined organization. VB: I understand when you came here, you knew the company was in trouble, but [it was] actually on the verge of bankruptcy, and you … found that out later. Kaplan: That’s right. … I found they were in violation of bank covenants on my second day on the job. And so ... it caused us to act fairly aggressively to reduce our costs and straighten out a lot of things. But it was a little more exciting than I bargained for. VB: What was your reaction when you found that out? Kaplan: Somewhere between shock and horror and dismay. But it caused me … to be galvanized in action. I was able to recruit some very, very good people to help me out of the situation. And a lot of cooperation from the bank. BB&T did a great job and stood by us. We started converting inventory into cash, and we changed the compensation systems, reduced the overhead and changed the basic manufacturing methodology to ensure our survival. VB: One of the first people you brought on was James Cline, right? VB: So, why did you think he could help turn around the company? Kaplan: Well, because he’d helped me before. Jim and I have worked together now for over 20 years. We had worked together for well over a decade prior to coming to Trex. I knew what his background was. He’s a CFO with operations in his bone marrow. He understands when he walks through a factory what to look for, and he knows the numbers. And he’s loyal, and he’s hard working. I knew he could do the job. I was very fortunate to be able to recruit him. As luck would have it, he’s now my successor. VB: Why do you feel now is the right time to retire? Kaplan: Well, that’s a good question. There’s a number of factors that come into play. But the primary reason is: I’ve done what I’ve been asked to do. I was asked to turn the company around, and we’ve done that. And I said the company’s profitable. It’s debt-free. It’s had a record year, followed by a record quarter. Things are going well. The staff is in excellent shape, and the sign of a good CEO, in my view, is to become superfluous. Everybody here knows what to do. They don’t need me anymore, frankly, which is a compliment to them. And the shareholders are thrilled to death. … [Of the companies in] the Russell 2000 stock index in terms of total return to shareholders since I’ve been CEO, we’re No. 6 in the whole United States. Our stock is up 1,200 percent. That’s almost without precedent, and so there couldn’t be a better time to go. Stock is high. Profits are good. The backlog is full. All systems go. Staff is ready. Got a successor in place. You couldn’t have a textbook design of a better succession plan than the one we’ve implemented. Didn’t have to bring in anybody from the outside. Kaplan: Well, the Trex situation was so dire that we couldn’t afford the luxury of ready, aim, fire. We had to just go ready, fire. We couldn’t agonize or wring our hands about any one decision ... One of the things we [did], was we overhauled the compensation system. We made it so that management and the rank and file were all in the same bonus pool. If one guy doesn’t make money, nobody makes money. If the company makes money, we all make money. Getting everybody in the same bonus pool had a tremendous effect on morale and motivation. My secretary gets paid on the same basis that I do. That was critical to our success. After that … we brought some 21st-century manufacturing science to the table. Suave readers read about the demise of American manufacturing. Well, the three top guys, we’re all the same age, we’ve all been in manufacturing for over 40 years. Manufacturing is not dead, and we’re going to prove it by making product that we would ship around the world and put Americans to work instead of somebody else. VB: A lot of people may not know that you’re a Certified Public Accountant. Kaplan: Oh, we don’t spread that around too much. VB: What drew you to the management side of the corporate world? Kaplan: Well … if you want to get ahead in corporate life, you’ve got to be flexible. I envisioned my life being in finance, and I was working in Pennsylvania for a large corporation. I was in a division as a controller, and it wasn’t doing very well. I never thought about doing anything other than accounting. That’s what I was trained to do. But one day the chairman walked in. He fired my boss. He looked at me and he said, “You want to be general manager?” So having survival instincts, I said, “Sure.” And the next day I found myself in charge of a forge, a hot-metal forge that extruded high-pressure cylinders. And so, a lot of it is by accident. I never really went back to finance … A lot of career actions are based on luck. Any guy who tells you they’re not is full of baloney. Being at the right place at the right time with the right skill set. So I’m glad I did it, and [it] seems like yesterday. VB: Reflecting back over your career, what are you most proud of and do you have any regrets? Kaplan: My mother wanted me to be a doctor, but I don’t have any regrets. She’s got a regret: She wanted a doctor … I think it worked out pretty good. I didn’t do bad for a kid from Buffalo, N.Y.
VB: And what are you most proud of? Kaplan: The fact that I’ve been employed for 40 years. That’s an accomplishment in itself. VB: How would you describe your management style? Kaplan: Depends on the situation you’re in. It can be collegial or it can be like Attila the Hun. Depends on the environment. But basically you’ve got to be … like a chameleon. You’ve got to have a wide range of emotion. Got to be able to go from euphoric to hostile in a very short period of time. You’ve got to be subservient. You’ve got to be aggressive. All in the same day. Going from department to department … I learned that management style from my parents. … They could argue with each other. My mother could yell. My father could yell. My mother could throw things. My father could throw things. My mother could curse. My father could curse. But when all was said and done, my mother had one weapon my father didn’t have. She could cry. It was game over. I realized a person who has one more emotion, won. So you find that most CEOs have a wide range of emotion. They can tell jokes, and they can be as hard as nails. So I can pat somebody on the back at 9 o’clock and fire somebody else at 9:30. Got to be able to do it all. VB: What direction do you see Trex going in the future? Do you see a certain area of growth? VB: You’re making things beyond the … pellets is what you’re saying? Kaplan: Yeah, we’re working on things we’re not going to discuss yet. We’re not quite ready. But when we’re ready, we’ll announce it. VB: What do you think are some of the biggest challenges the company is facing? Kaplan: Well, I worry about things that we have no control over. For example, Greek bank defaults … Middle Eastern wars. High gas prices. Anything that’s going to upset the American consumer is something I worry about. Nobody needs a Trex deck. It’s a luxury item. So, if people figure they’re going to lose their job or have more of their money being spent on gasoline, that’s less money available for vacation, a second car or a Trex deck. Those are the challenges. Make sure the economy stays in a growth mode. People have got money in their pocket and feel good about the future. Kaplan: No. We don’t have any trouble getting people to Winchester. It’s tough getting them out once they get here. But there was a time when Trex was thinking about moving to the Dulles Airport area. That was a disaster. Like 70 people quit their jobs because they thought they were going to have to drive to Dulles Airport. That was before my time. But I’d heard about. So it’s a great workforce. I couldn’t be more proud of the situation which it finds itself. Trex and the Shenandoah Valley. Kaplan: Well, I had a good job. I was … CEO of Continental Global, making mining equipment …As a matter of fact, here’s a picture of my house in Pennsylvania, and just by coincidence I had a Trex deck long before I ever heard of Trex. Before they called me. That’s why I put the photograph up there because it proved I had a Trex deck. But it [gave me a] chance to be in consumer products which is very interesting if you’ve spent your whole life in manufacturing and industrial to be able to put together TV commercials and brands … Plus, I knew it was a turnaround situation. The stock had gone from $50 to $6. So, I knew there was a chance to make a lot of money, to be quite frank about it. Plus, the big factor was all the plants were in the United States. I had sort of gotten tired of those 17-hour flights to Malaysia and China and everywhere else. VB: What do you do to relax? Kaplan: I do a lot of shooting sports. I shoot trap and target shooting and I hunt groundhogs. I love to hunt groundhogs … and I play a little tennis. I take long, long walks through Winchester and the countryside. Every day at lunch time I take about a 4-mile walk. And I drive my convertible. I’ve got a fire engine red … Mercedes convertible. It’s a great part of the country just to drive in. Lot more satisfying than playing golf.